In October Peter and Edwina visited Moi’s Bridge in Kenya. Here is a brief report of their visit. Moi’s Bridge is a rural town in western Kenya. 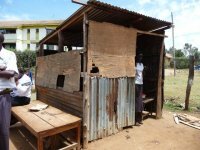 It is a busy town with people bringing goods to sell from their “stalls” along the side of the Eldoret to Kitale road that runs through the centre of Moi’s Bridge. 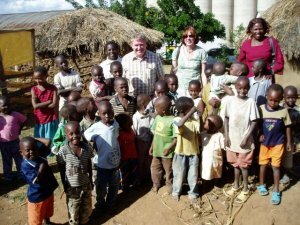 We stayed with local Pastor Maurice Chesoli, and his family. They live in a tin roofed, three roomed house, built on a small plot of land. Water is collected as needed from a well. The kitchen is a separate building and charcoal burners are used to cook with.  Lighting is by kerosene lamps. The toilets are traditional earth pit ones. We were made most welcome by the family, their neighbours and friends. Photo (above) the new school. 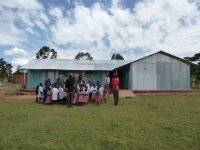 We visited the school we are supporting. It is called the Waymarks Education Centre. 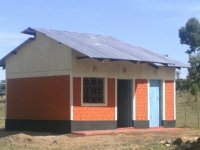 The old, very small, buildings are being replacing with new larger ones on nearby land Aid2Africa is buying. The teachers are really enthusiastic and caring. The kids love them and work hard for them. 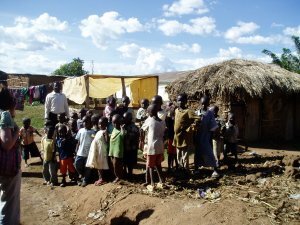 Many of the children are orphans, many of them live in the local slum area of the town. 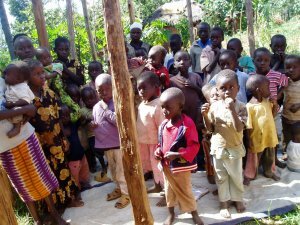 Photo (below) is the children of the slum. We visited the slum and were warmly welcomed by many of the children and James, the man who has taken on responsibility for helping them. Many of the children still have no access to education. The new school will be large enough to accommodate the remaining 100 slum children who are still without access to schooling. We hope to achieve that sometime before the end of 2011. We visited a small orphanage and were quite distressed by the level of need. Despite having nothing, (even their clothes are hand me downs that will be handed on when they grow out of them) they were cheerful and welcoming. There are a few things we hope to do there in the coming months to make life a little better for the children and Margaret, the lady who cheerfully looks after them. Currently there are 30 orphans dependant on her. The picture (above left) shows the classrooms. They have marked with posts where they hope to eventually build them. We took literally hundreds of photos while we were there and hope to get many onto the website for people to view. 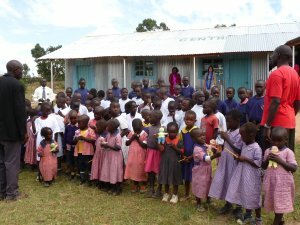 We have been able to link this school in Kenya to a school in Coventry and look forward to seeing the relationship between the schools grow and blossom. The first exchange of letters and photos will hopefully be before the end of the year. Children of the slums, these are some of the children we want to get into education. If you would like to work with them as a volunteer, contact us . 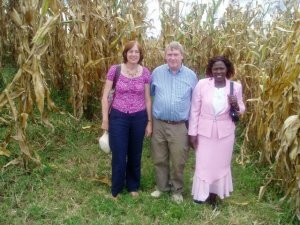 We visited the land Aid2Africa has rented and paid for its cultivation. The maize harvest was in full swing and has now been sold. From the income there is enough to pay for the cultivation of the same land again for the next season. There is money left over which will pay 10% of the staffing costs of the school for a year. Next season we will plant twice as much land and move the school closer to being self sufficient and independent of external funding. We have already planted fruit trees on the new site to help supplement the diet and hope to include a poultry project soon as well.